If you walk an average of 20,000 steps a day that is roughly about 10 miles. The average running shoe lasts about 800 walking miles. Let that sink in. 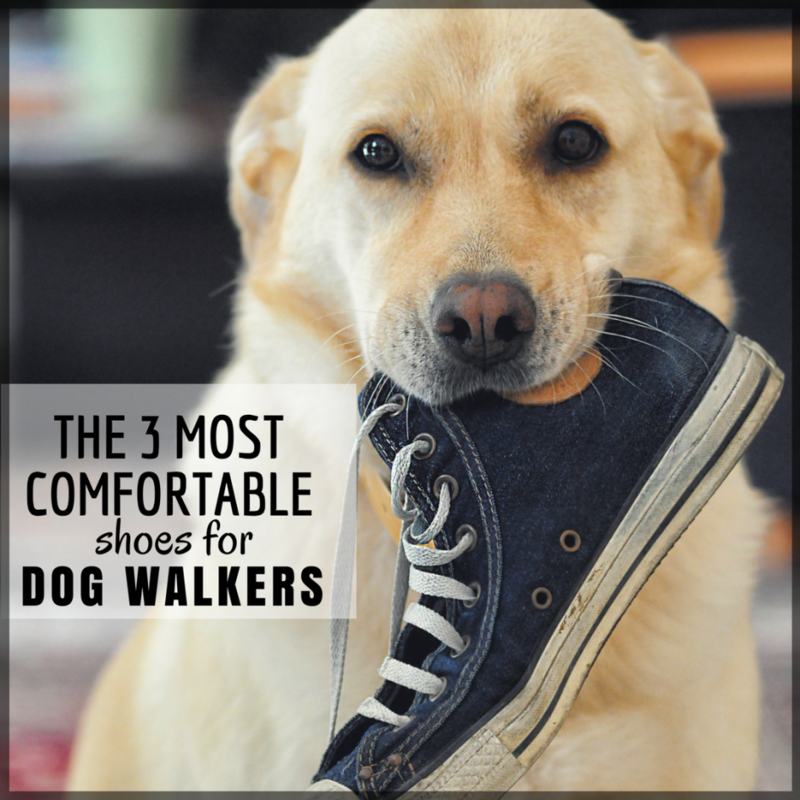 For dog walkers, selecting shoes is comparable to purchasing a house or a car; you’re going to spend a lot of time in them, so you want something you really like. Buying the right shoe is not as easy as it sounds: the market is packed with a confusingly broad range of shoes. I have found that running branded shoes last longer and tend to be more comfortable. For reference, I do about 8-15 walks a day/ 5 days a week and I tend to replace shoes every 5-8 months. I have bought a lot of shoes over the years but I keep going back to same three brands; Asics, Merrells, and Nike. To make your life easier I have narrowed it down to my first and second choices for each brand. For you Sketcher lovers out there I even added a bonus review for you too. First and foremost, before you buy a new pair of expensive running shoes I suggest either going to your local running shoe store and get properly fitted for a couple different brands or check out the Runners World “How to buy the right running shoe”. Improper shoe sizing and shape can lead to muscular imbalances and achy feet; something we as walkers do not have time for. Asics have been my go to shoe for years, even before I started walking dogs. Asics’s lineup of running shoes is impressive and there are a variety of options from cushioned to stability type shoes. I tend to like Asics more because they focus on the function and performance of the shoe rather than the appearance or style; they only make running, cross training and volleyball shoes. I have personally owned the Nimbus, GTs, and Gel styles but my favorite is by far the Gel Ventura 5. The Kayano 22’s is a great shoe they are a bit firmer than the other cushioned versions. They come in a variety of colors and they fit a narrow foot better. The downfall is they are bit pricier then other Asic styles. I personally like the look and comfort of the Venture more. When I am not wearing my Asics, I am wearing my Merrell’s; I use these more for working out but they make a phenomenal walking shoe. I love the flexibility, slip resistance, construction and durability of the brand. I should mention Merrell is known for its minimalist barefoot like style- if you are new to this type of shoe it will take some time getting used to. If you do not like the zero drop shoe style then I recommend the Trail Crusher. It is extremely comfortable, looks great, and is a durable shoe. Bonus: they cost a little bit less too, woop! Nike is well known brand and carries an extensive line of running shoes and you cannot go wrong with most of them. I chose the Tanjun because I wear these daily outside of walking dogs because they are a nice looking casual shoe. The Tanjun is a no fuss, lightweight, and breathable shoe. These are very similar to the Tanjun but the tongue is fixed in its place, the cushions seem to be thicker and they have a thinner sole. I prefer the Tanjun more because of the non-fixed tongue but this is another awesome walking shoe. I will start off this review by saying I do not own these, I personally do not like Sketchers. HOWEVER! I know a lot of nurses and fellow dog walkers who LOVE these. My review is based off their opinion and my first impression. I will admit these are a better-looking shoe then the go-walk and I may have even considered buying these! They are extremely comfortable, affordable, and are easy to break in. The one downfall mentioned from my walker is they do not last long but for the price she was okay with that. The shoes you choose to walk in are important, but the socks you wear on a daily basis are arguably as important when it comes to a comfortable walk. Instead of slipping into a pair of cheap socks from a superstore look for something with soft cushioning, support, ventilation and a great wicking material like the Balega sock. They are a bit pricey but I love these and I love that they never slip down into my shoe (BIGGEST pet peeve). Regardless of what shoe I buy the first thing I do is coat them in the Sof Sole Water Proofer and let them dry completely. This magic in a bottle repels water, dirt, oil and prevents staining. I will do just about anything to make my shoes last a few more months and this helps keep the shoe from looking dingy. I am no stranger to the stinky running shoe especially after doing 15 walks in 80-degree weather, wowza. If you tell me your shoes don’t stink I would call you a liar. Moving on, I’ve tried the newspaper trick, the dryer sheets, and every kind of fabric refresher out there and they all just masked the smell for about 10 minutes. Then a local gym owner mentioned the Lumi Outdoors Natural Shoe Deodorizer Spray while we were talking about stinky lockers and I LOVE this product. It is made with essential oils and it is a bit potent; I recommend spraying at night and letting them fully dry.